Buxton (Derbyshire, England) was in 1904 a fashionable Spa and tourist resort. Known as 'Aquae Arnemetiae' in Roman times, the town grew around natural thermal springs. By the 16c., visitors (including Mary Queen of Scots) came for the waters. In the 18c., Buxton grew rapidly as the Crescent was built. 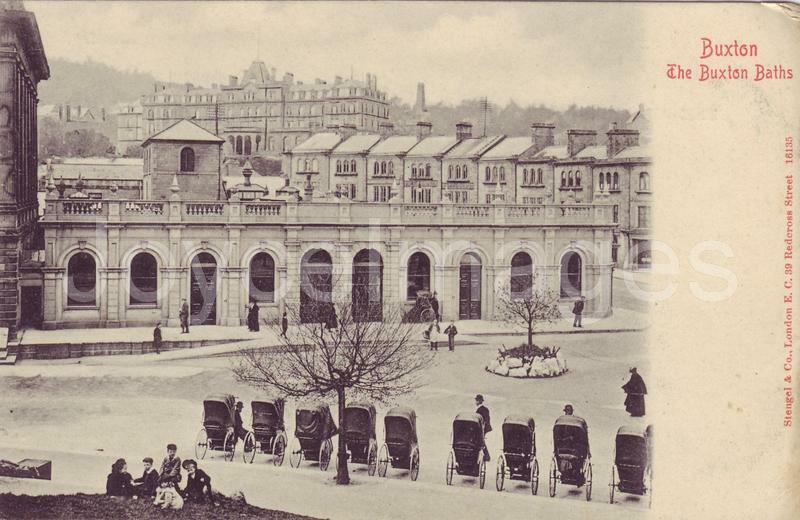 In Victorian times, its population trebled with the coming of the railways; the Pavilion Gardens, new baths, pump rooms, hotels and churches were added. At the turn of the 20c., electricity and telephones arrived. In 1901, a new theatre opened, and in 1903, a magnificent Opera House. This PC shows the Buxton Baths; notice several 'Bath chairs' lined up, and a Jesuit priest!